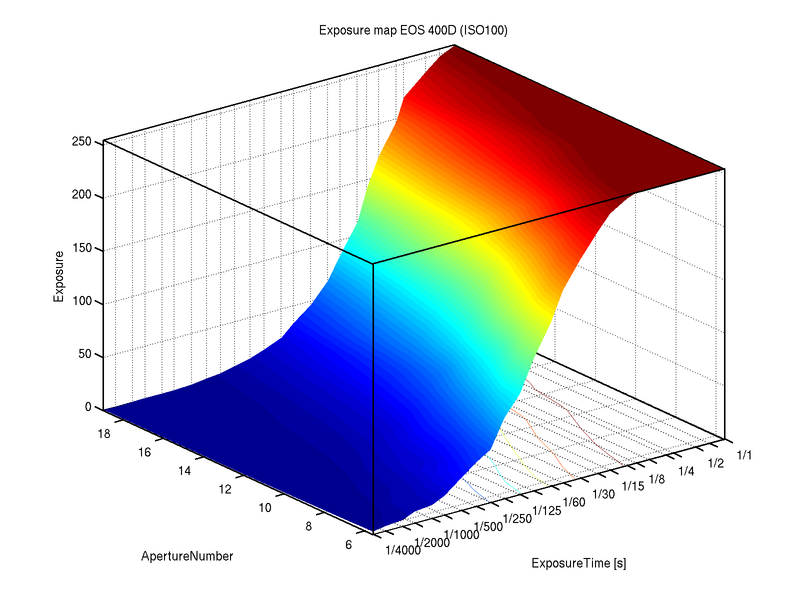 The diagrams below depict the exposure level for different exposure times and aperture numbers for the Canon EOS 400D + EF-S 18-55 at constant light conditions. 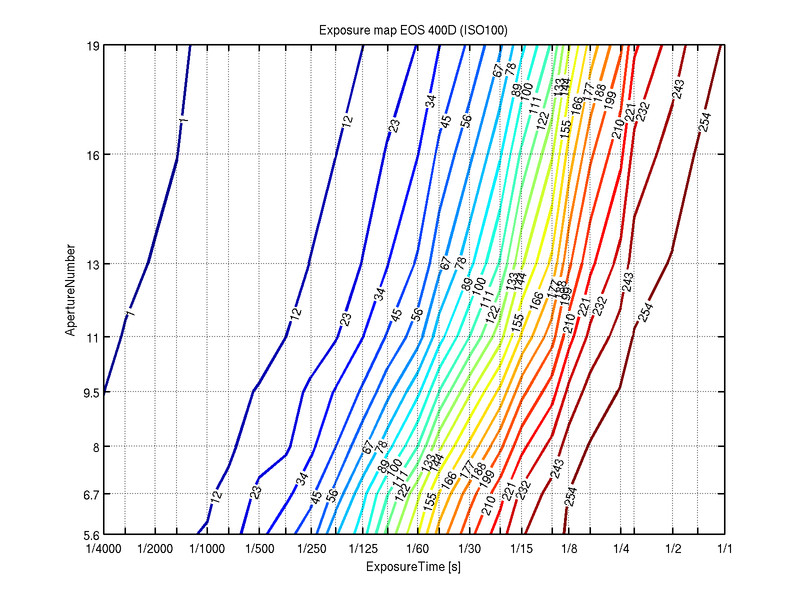 On the x-axis of the diagram the exposure time is plotted. A log-scale was chosen for more convenient visualisation. The y-axis represents the aperture number as chosen in the camera (linear scale). The isolines depict the mean exposure level of the images averaged over all pixels. The images have been converted from RGB to greyscale before averaging. Due to the image resolution of 8 bit, the numbers range from 0 to 255. The parameters of the experiment were chosen to achieve a totally exposed or totally dark image at the scale ends. In order to obtain constant and homogenous light the lens was covered with a white sheet of paper and exposed to constant light from a desk halogen lamp. Before the measurements the white balance was adjusted. An example image is shown here. The exposure values are listed in the following table as numbers with the corresponding grey tone as background. The Matlab script for generating the plots can be downloaded here. If the corresponding data file exposuredata.mat is copied into the working directory it will be detected automatically so the diagrams can be plotted without the 200 test pictures. An ASCII data file can be downloaded here: exposure.ascii. Canon is a good camera for macro butterfly pictures. This was a nice explanation of exposure.